Our distributor had been working on this project for upwards of six months. 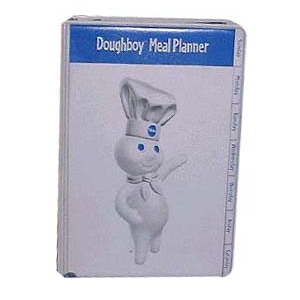 Pillsbury wanted a planner that could fit into a coat pocket. The binder was to hold index tabs, recipes and vinyl pages that could hold store provided coupons. There was to be pockets inside the front and back panels, and a pen loop. Ad Industries recommended against such a small size binder and convinced the distributor that a clip would serve better, along with the pockets to hold the many coupons that this planner would contain. The end user was very receptive to these changes and a prototype was constructed and approved.